A 17 year‐old girl sets out on a journey from heartbreak and confusion to transformation as she discovers love and life after tragedy. “TIGER EYES” marks the first major motion picture adaptation from the work of iconic author Judy Blume, renowned chronicler of the most private and charged emotions of teens, whose books have sold more than 82 million copies in 41 countries. Forced by her grieving mother to move from her home in Atlantic City to the strange “atom bomb” town of Los Alamos, New Mexico, Davey (Willa Holland) no longer knows who to be or how to fit in. Everything that once mattered – the friends, reputations, parties and expectations that fuel high school days – suddenly seems insignificant and Davey is certain no one has the first clue about the turmoil she is going through. But when she meets Wolf (Tatanka Means), a mysterious Native‐American climber exploring the surrounding canyons, she feels he is able to see right into her most wild and secret emotions. Their intense relationship brings Davey back from the edge as she finds the courage to embark on the first great adventure of her life. 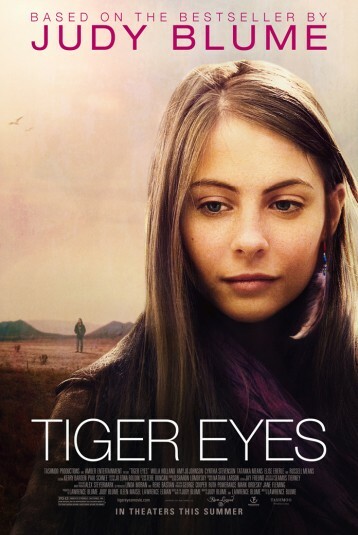 "Lawrence Blume’s Tiger Eyes, based on the classic teen novel by his mom Judy Blume, is the rarest of family films, smart and nuanced, with an attention to detail in images that mirrors what is Ms. Blume’s strength with words. It’s a passion project for mother and son and it shows." "The mother-son creative team for 'Tiger Eyes' relies on magnificent cinematography, apt casting, and a story line of loss and self-discovery that will resonate with a wide audience." "A heartfelt adventure of a movie"